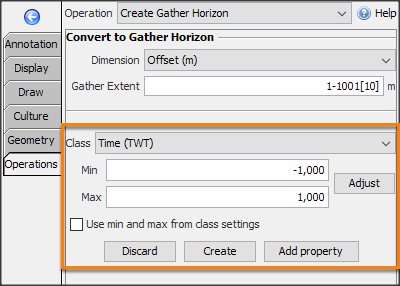 Use this operation to add a gather dimension to a 2D or 3D horizon. The result will be a horizon with a single value for all positions in the gather. Where is the Create Gather Horizon ... operation? The Create Gather Horizon from Non-Gather Horizon operation is found in the Map View, under the Operations tab (along with other horizon operations). 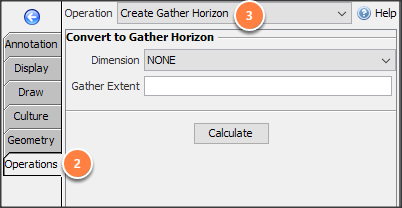 At Operation, select Create Gather Horizon from Non-Gather Horizon. In the navigation bar, select the horizon to convert. 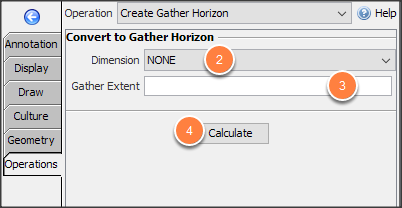 Select a gather Dimension for the horizon. Use the format: Min - Max [Increment]. Note: By default, the new horizon will be named: “extent_value IL/CL (across gather_dimension)”. For example, the operation above will yield a new horizon called "1,000 ms IL/CL (across Offset (m))". To rename the horizon, see Horizon Details and Configuration.